Yep a summer scarf…just because there’s no longer an ‘r’ in the month, it doesn’t mean I can expect to be warm! I’ve only ever made baby blankets from cotton yarn and wanted to try out something wearable. 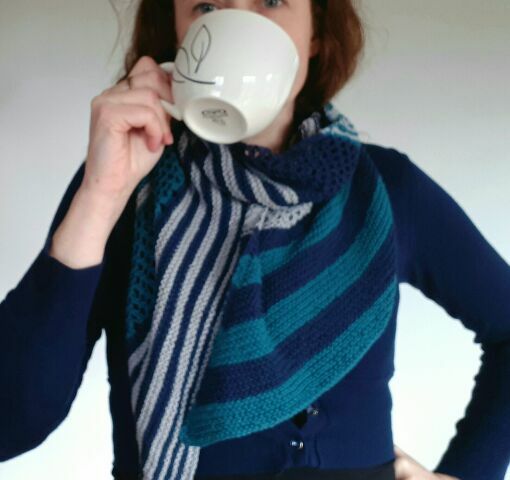 I found the free pattern on Ravelry – its slanted and interesting but not too fiddly. It’s called Filo Biased scarf. 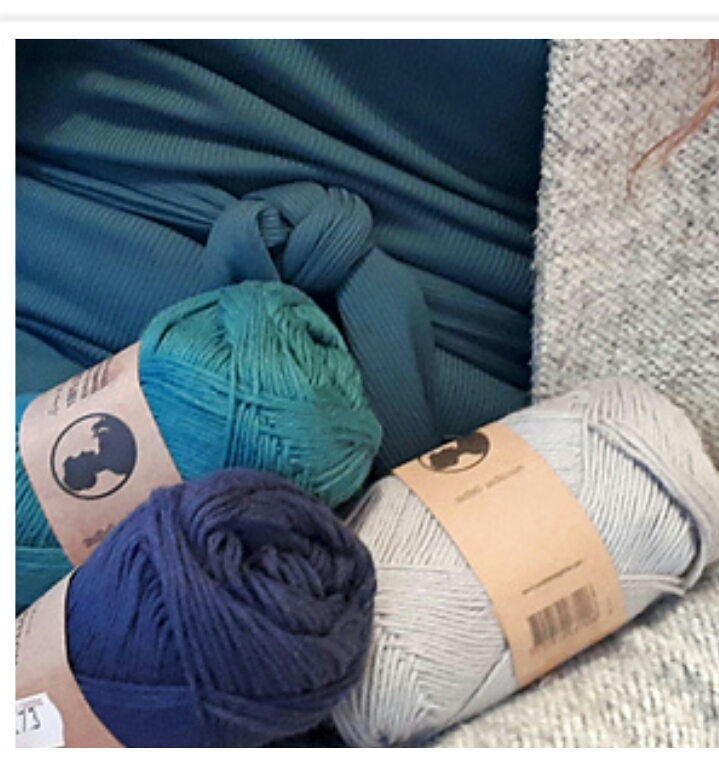 I’d say it would be a good second project for a new knitter – it’s mostly garter stitch (plain knitting) with a few other techniques like increasing/decreasing and yarn-overs added in. 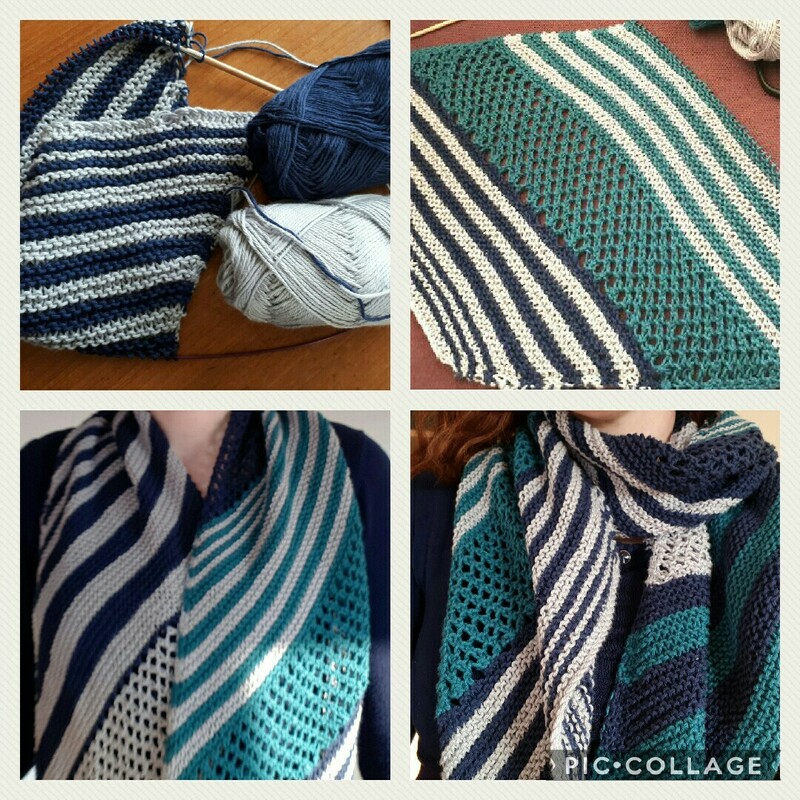 As often happens, I didn’t follow the pattern exactly – I gradually made my stripes thicker and added in more of the mesh panels because they were nice and quick to knit! 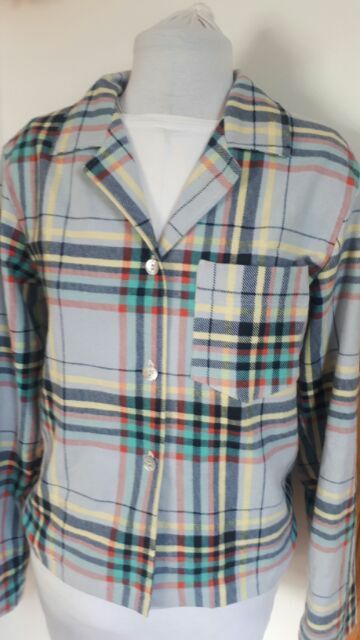 I bought the cotton in a shop called Sorensen Green in Cork city … my brother said it was my kind of shop and he was right … lots of bits and bobs that I didn’t need, but had to buy! I did stop at three balls of cotton though – and told myself I had to use those up before getting more. But of course now I’m sorry I didn’t buy more! Especially since they cost less than €2 per ball. When I got home, my daughter pointed out the yarn colours matched what I was wearing that day … so at least the scarf was guaranteed to match something in my wardrobe ! Anyone else who matches their shopping to their outfit? I liked the feel of knitting with cotton and am trying to decide what to make next. Hats are a great way to use up leftover yarn from jumpers, and to try out new techniques without wasting too much time if you don’t end up liking the final result. Wurm Hat, made with leftovers from two cardigans. 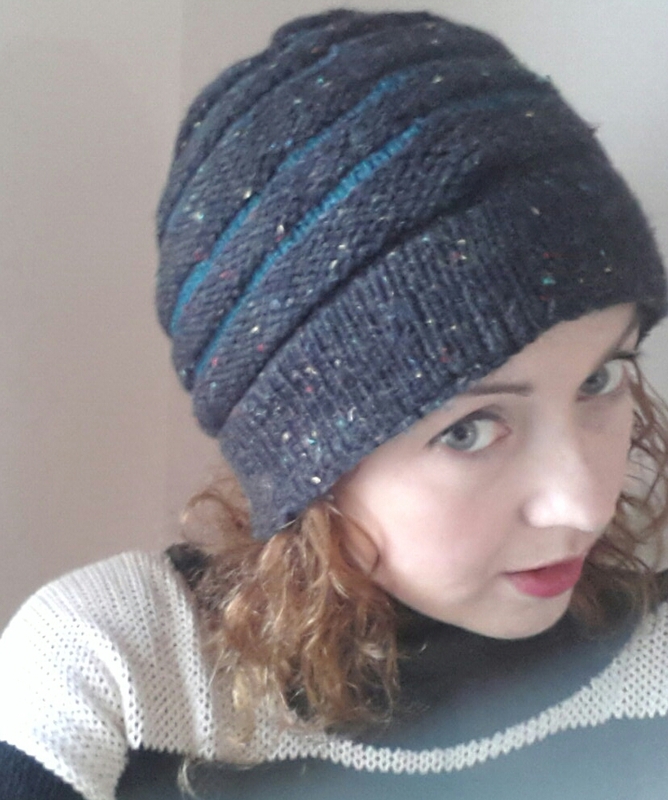 This is my Wurm Hat – made with a very popular free pattern available on Ravelry. I used aran yarn, leftover from my Miette Cardigan and my Myrna cardigan. It has a nice thick band, made in the same way as a folded hem. The ridges give it plenty of stretch to fit over heavy curls, or to fit different sized heads. A very easy make that would be great for a quick present. The next hat was made without any pattern – I made a guess at how many stitches after a quick swatch. Because I was using ribbing, it would be stretchy enough to make up for my lack of prep! I used fisherman’s rib* for about five inches – it’s the nicest squishiest rib – little pockets of air to add warmth to your hat. I held two shades of grey sock yarns and treated them as one, so it gave a lovely marled grey effect to the hat. There was a real difference in the warmth of this hat, and I’d recommend using sock yarn or something with wool for hats. The acrylic one above (Wurm Hat) was good to keep out the cold, but a hat with wool will hold in the heat much more effectively, and without being clammy. I changed to a basket weave pattern and decreased a few stitches for a couple of rounds before gathering all the remaining stitches to close the crown. The photo above was taken on a lovely day in November, I had a little time to kill so I sat by the lake knitting my red jumper. The stone wall I was sitting on was freezing, so I took my hat off and sat on it instead – It was bizarre how warm it felt, completely insulating me from the cold stone! This was a beret shape – I cast on using a little guesswork again. I then worked it for a few inches, trying it on all the time. When I reached the crown, I placed markers, roughly dividing the circumference by five, and then decreased at the markers every few rows. I had every intention of writing the pattern as I was going along, but I just got carried away, with how quickly it was coming together! If you’ve gotten this far you might want to hear the twist in the tale… ? The one thing these hats have in common is that I have lost ALL THREE OF THEM!!! Seriously.. no idea where or when. They all got worn for about three months each, before being abandoned or lost who-knows-where! I hope that someone, somewhere is enjoying them… as for me – I could get ahead of myself and knit some more in time for next winter..! It’s been a while since I’ve shared any making…and this was finished (and worn) on New Year’s day, so it’s definitely time to show it off! This is Sweet Jane, an a-line jumper with an asymmetrical hem. I managed to make mine longer than the original….I even considered making it into a dress as it wouldn’t have taken much more yarn to get there! Above – Cloud reflections while Lakeside knitting in Killarney last November. I was waiting around there for a day, and it was the nicest day, just drinking coffee, strolling around and doing some knitting …. how middle-aged can I get! Made from the top down in one piece. My gauge was pretty close to the pattern, so I didn’t make any changes except to stop increasing after the waist, so mine is a little less flared than the pattern. I was working on this at a very busy/stressful time (apart from that one day above!) and it was a great distraction when I needed a minute of calm. I’m delighted with this jumper – I can honestly say I would buy this if I saw it in a shop. I’ve worn it at least once every week since I finished it in January. The yarn (Ella Rea cozy soft) has 25% wool making it warm but still lightweight and breathable. I could do with making another in either teal or grey/black. The only thing stopping me is that even though it was an easy knit, it got boring! All the stockinette was nice for zoned out knitting, but it did start to wear on a bit near the end. If I was to make another, I think I’d work on a hat or scarf with an interesting pattern and swap between them, depending on my mood. The only other thing to mention is that I’ve noticed it getting more out of shape around the neck and shoulders as I’ve worn it – because it’s made in one piece it doesn’t have the support of shoulder seams. I did a little surgery on it the other day with a crochet hook – picking up stitches along the inside and crocheting a chain to hold the shoulder line and support the back neck. It’s made a noticeable difference, and I’ll be doing the same if I ever make another version. Right now I’m working on two different cardigans, but I’m thinking of undoing at least one of them – it’s the Myrna Cardigan from Andi Satterlund. I’ve made it before in green (see below) and it’s gotten a lot of wear – over dresses and shirts.